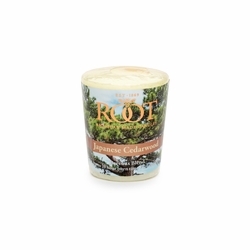 Root Candle's decorative votive candles are made with Root's proprietary natural beeswax blend using pure essential oil fragrances and an all-natural cotton wick. 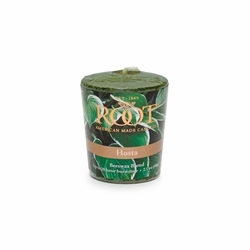 Root Votives produce a long-lasting 20 hour burn with a rich sensory experience. 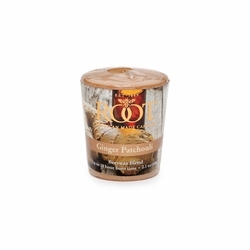 These votives are individually wrapped to protect the smooth satin finish and come in 42 luxurious fragrances and a wide variety of trending designer colors. Made in USA. Uplifting citrus, grapefruit and bergamot contrast with the heavy lemongrass and marine ozone notes. Orange blossoms and mandarin tie into the warm base of cedarwood, musk & vanilla. 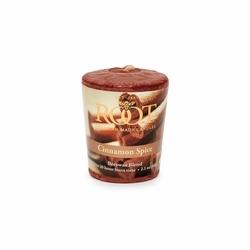 Rich, warm baking cinnamon blends with clove, sugar cane, caramel, and vanilla for a sweet cinnamon celebration. 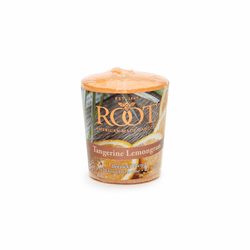 A sensuous blend of ginger, clove, and mace with earthy patchouli softened with geranium. Leafy greens, green apple, rose, jasmine, lily of the valley, hyacinth, and plumeria flowers. 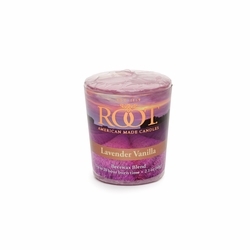 Sandalwood and cedarwood, combined with the aromas of citrus, lavender, and sage. Glistening lavender bursts with sparkling juicy citrus notes of mandarin and clementines, blended with precious hyacinth and satiny sweet pea, classic jasmine petals, and white peony.